It was great to welcome Phyllida Scrivens to the network’s lunch as a former NBWN member. Despite it being holiday season, we had the largest number of attendees for an August lunch since we can remember! Phyllida wanted to be an author from the age of ten and it was inspirational to hear the story of how she realised that dream – from running a bed and breakfast business for three years specifically to fund her writing ambition to hearing about the plans for her next project: My Lady Lord Mayor: The Seventeen Female Lord Mayor of Norwich 1923-2017 (which we hope she will come and talk about in the future). 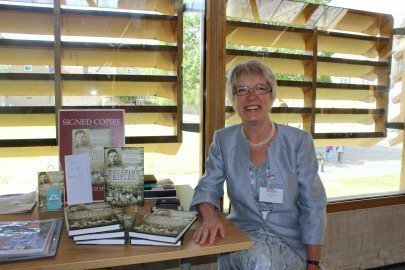 Her fifty year ambition of becoming a published author came true in January 2016, thanks to a Masters Degree in Biography at UEA, a chance encounter with a Jewish German refugee and four years of research and writing. She talked about the steep learning curve as a post-graduate student at the University of East Anglia and with Pen and Sword Books; over four and a half years. Escaping Hitler is the remarkable true story of 91-year-old Norwich resident Joe Stirling, a Kindertransport boy destined to become Sheriff of Norwich, and who continues to create interest at frequent speaking events and festivals throughout East Anglia and recently in Germany. Phyllida told the story of her visit to Joe’s birth village of Nickenich in the German Rhineland, where she told the story to villagers (whose parents and grandparents had known the family) of what had happened to the little boy who left their village with his anguished mother the morning after Kristallnacht after watching his father being arrested by the Gestapoall those years ago. What is immediately obvious was that Phyllida is enjoying every minute as a published author and the lunch was a fascinating insight, not only to Phyllida’s subject and his remarkable story but also to her personal dedication to pursue a lifelong dream of writing. I think we could all take something positive away from that lunch – that if you have the passion, drive and dedication, anything is possible!